The Man Without Fear is about to make his Netflix debut, and judging from what we've already seen, a lot of you will be up late this weekend watching all 13 episodes of Daredevil. Plus, Game of Thrones is back — and the current seasons of 12 Monkeys and Helix are coming to an end. When Eva Sinclair's (guest star Maisie Richardson-Sellers) reemergence leaves Rebekah trapped and helpless, Klaus (Joseph Morgan) is forced to put aside his mistrust for Freya (guest star Riley Voelkel) in order to save Rebekah's life. Meanwhile, Hayley (Phoebe Tonkin) and Elijah (Daniel Gillies) learn more about Eva's violent past from Josephine (guest star Meg Foster), who then makes a startling revelation about Hayley's future. With time running out to save Rebekah, Marcel (Charles Michael Davis) turns to a reluctant Vincent (Yusuf Gatewood) for his help to take down Eva, but his plan takes an unexpected turn, as Eva will not go down without a fight. In the first of tonight’s two episodes, Star heals Marco’s arm — and accidentally turns it into a tentacle. Then the Diaz family’s charming former exchange student Gustav visits, and Star’s convinced he has a nefarious motive for coming back. Julie and Nikki join forces to search for Victor; Tony's confession has a big impact on Adam. Jeff squares off against a charming prison inmate Willy who's attending Greendale via telerobot. This week’s episode is titled “You Are Not It." The final four contestants must take a classic Wild West archetype and reimagine it as a steampunk cyborg character. When Clive recognizes this week’s murder victim, he’s surprisingly quick to refuse Liv’s help. So Liv and Ravi decide to investigate on their own — not the best idea they’ve ever had. And we’re talking about two people who actively seek out zombies. Skye’s quest to control her powers takes a surprising turn when she encounters an enigmatic Inhuman leader named Lincoln. This week’s murder mystery, ahem, kicks off when a ballet shoe is discovered with a severed foot inside. The Daily Show’s Aasif Mandvi as a software CEO whose life has unraveled after a hack attack exposed all his secrets. Naturally, he’s not behaving like his old self. This week’s episode sounds like it was ripped from the headlines — 1996 headlines: "The Cyber team must track down a bomber fixated on revealing the "truth" about society's overreliance on technology." If you’re a fan of Clarence, you can watch new episodes every day this week at 5 PM, and it’s part of this week’s Thursday evening lineup. On Steven Universe (5:30 PM), Greg tells Steven the story of how he met Rose-Quartz. On Teen Titans Go! (6 PM), Cyborg wants to have an '80s TV show marathon, but the remote is missing. And on Regular Show (7:30 PM), the park guys want to get rid of a very large bird in the park. Forget what you think you know, because everything is about to change. As Golan (Ori Pfeffer) arrests Emma's (Alison Sudol) suspected killer, Peter (Jason Isaacs) makes a startling discovery. In Croatia, Avram (guest star Guy Selnik) and the red heifer are kidnapped by a stranger with a mysterious agenda. In New Mexico, Tad Billingham (David Costabile) desperately tries to keep Debbie (Lauren Ambrose) and Josh (guest star Zen McGrath) from exposing his secrets. So we’re keeping up the charade that this is an actual show? Okay, we’ll play along: "Oracle, Hero and the genius inventor Daedalus form an unlikely alliance to find Hero's birthright – the Ring of the Magi." The Viking army embarks and Paris goes into lockdown as the army prepares the defense, overseen by Odo. The Vikings are determined to make it through the gates of Paris and will stop at nothing to succeed. It’s here at last! The entire first season of Daredevil comes online on Friday, hopefully ready to wash away memories of the Daredevil movie. We like what we’ve seen so far. Fingers crossed that the rest of the season lives up to expectations. This week, Nick and Hank are trailing a killer who leaves their victims frozen solid. Elsa, is that you? On the season finale, Cole and Cassandra attempt a final confrontation with the Witness, while Jones faces a new threat to the mission. And on Helix’s season finale, the past, present and future collide as everyone's paths take some unexpected – and tragic – turns. As the winter storm continues to pose a threat to all of Middleton, Cassie and Sam work together to save a life and a crisis magically brings them closer. With the arrival of the Duke of Sandringham, Jamie hopes the price on his head will be lifted, while Claire cares for an abandoned child. Start humming the theme song, because at long last, Game of Thrones is back! While Cersei and Jaime adjust to life without their beloved(?) 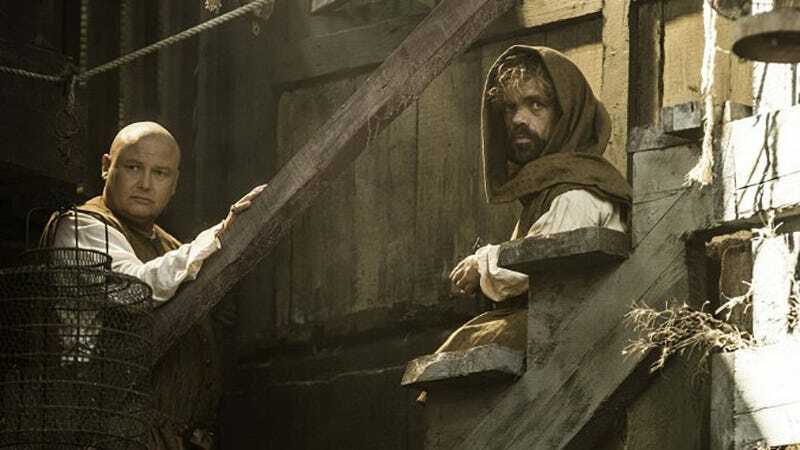 father, Varys reveals a conspiracy to Tyrion. Jon finds himself stuck between two kings from either side of the wall and Daenerys faces a new threat to her rule. Whatever hijinks Phil Miller gets up to this week, he manages to alienate the rest of humanity. So basically we're maintaining the status quo. Mary initiates the second act of the Grand Rite; Alden returns to Salem.